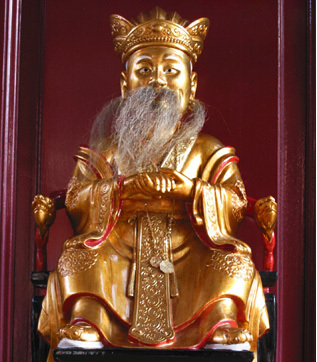 The Jade Emperor or‘Tian Gong’which is commonly used, is the Taoist ruler of Heaven and all realms of existence including that of Man and Hell. Buddha, the founder of Buddhism. 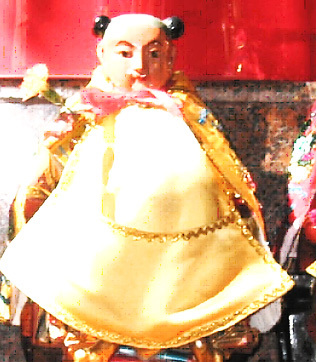 It was said that the Jade Emperor was originally the crown prince of the kingdom of Pure Felicity and Majestic Heavenly Lights and Ornaments. At birth he emitted a wondrous light that filled the entire kingdom. When he was young, he was kind, intelligent and wise. He devoted his entire childhood to helping the needy (the poor and suffering, the deserted and single, the hungry and disabled). Furthermore, he showed respect and benevolence to both men and creatures. After his father died, he ascended the throne. On 9th of the 1st Lunar month which is the birthday of the Jade Emperor, a ceremony for celebration will be held and devotees will gather and worship the Jade Emperor to pray for blessing and longevity. According to tradition, it is also believed that on 25th of the 12th Lunar month, the Jade Emperor will descend from the Heaven to do his rounds on Earth, devotees will also burn joss sticks and incense papers on this day to worship Him. Confucius (Full name: Kong Qiu), was a thinker and social philosopher, whose teachings and philosophy have deeply influenced the thoughts and lives of many people worldwide. According to records, Confucius was born in September 28, 551 BC, in the city of Qufu (now part of Shandong Province) and passed away at the age of 72 years old due to sickness. Confucius was initially Justice Minister, a high-ranked government official of the Lu Kingdom but resigned from his post as he was disappointed with the Duke of Lu’s indulgence in pleasure and his negligence of his official duties. After resignation, he dedicated his whole life to teaching the common people and even led his students to travel to other kingdoms and thus was the first person to implement common education. It was believed that he had at least 3,000 thousands students, out of which, 72 of them are the most outstanding. Other than teaching, he was also an author/editor. It was said that the Five Classics and the Spring and Autumn Annals were some of the books he edited or wrote. His students compiled his teachings and sayings into　the “Analects” which have greatly influenced the Chinese culture, and are often referred to by the people. He taught the importance of wisdom, common education, cultivation of noble human character, development of one’s thinking and the application of theoretical methods. As he was a great educator, nowadays, many parents will bring their children to temples to pray reverence to Confucius before their examinations or on HIS birthday (27th of the 8th lunar month) for blessing and wisdom. 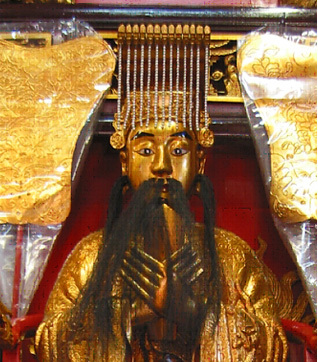 Tai Sui when translated from Chinese, IT is known as the Yearly God and there is a total of 60 Tai Sui. As most of the Tai Sui are warriors in the past, that explains the title of “General” given to them. Each year, there would be a new Tai Sui on duty looking after all matters on earth and there will also be some Chinese zodiac sign that has opposing forces with the Tai Sui. These zodiac signs are said will suffer some form of bad fortune. As such, in Taoist’s practice, devotees who are affected, are advised to pray to the Tai Sui at the beginning of the Lunar Year (within the first 15 days), seeking for protection and peace that would deflect the negative influence. Furthermore, one must also remember to return thanks before the winter solstice or also known as ‘Dong Zhi’. 6th of the 3rd Lunar month) by temples so that devotees can worshipped her.